Fish and game wardens serve state and federal agencies as commissioned law enforcement officers responsible for monitoring and managing wildlife, as well as tracking and apprehending poachers. They protect wildlife; enforce fishing, hunting, and boating laws; and patrol lakes, rivers, beaches, wetlands, coastlines, deserts, and the back country. They are employed through each state’s fish, parks, and wildlife department, while federal fish and game wardens are employed as special agents with the U.S. Fish and Wildlife Service. Because fish and game wardens are commissioned peace officers, they can cite people for a wide assortment of crimes that occur in the regions they supervise, as well as conduct investigations, collect evidence, and search homes and vehicles. In certain jurisdictions, fish and game wardens are called wildlife officers, conservation officers, or gamekeepers. Fish and game wardens have broad duties within the law enforcement spectrum, such as ensuring that hunters, fisherfolk, and trappers meet licensing requirements, as well as seizing fishing equipment, firearms, vehicles, watercraft, and other equipment and property used in the commission of fish and game crimes. Education: Most states require that fish and game wardens have two years of college study, while other states require a four-year college degree. In some states, a two-year degree combined with wildlife or law enforcement experience can result in waiver of the four-year college degree requirement. Other requirements: Most states require applicants to be at least 21 years old, although several states permit game wardens to be 18 years of age. Fish and game wardens must possess a valid driver's license, be in good physical condition, be a U.S. citizen at the time of appointment, and have no felony convictions. Applicants may be required to pass a physical fitness, vision, and hearing test. Fish and game wardens may also be required to pass a state peace officer licensing exam. Upon completion, cadets undergo several weeks of field training in wildlife conservation as well as fish and game enforcement issues. Physical stamina: This job may require hiking, walking, swimming, and running over rough terrain, sometimes in bad weather. You must be able to successfully apprehend violators and perform search-and-rescue missions. Communication and interpersonal skills: You will need to educate the public, as well as deal effectively with those involved in an incident, accident, or crime. You may also be called upon to testify in court. Leadership skills: You must be prepared to take charge and handle sometimes difficult or stressful situations in a calm, reasonable manner. Strong moral character: As a law enforcement figure, you must have honesty and integrity in dealing with people, wildlife, and the environment, as all of them rely on you for protection. The U.S. Bureau of Labor Statistics provides job outlook information for fish and game wardens under its classification for police and detectives. Job growth for the fish and game warden profession is expected to increase by 4 percent up to 2026, below the 7 percent growth rate for all occupations. Fish and game wardens work extensively outdoors in natural settings such as state and national parks, lakes, streams, deserts, and mountain areas. They also work in inclement and hazardous weather conditions, during natural disasters, and under other dangerous conditions that may threaten their health and safety. They may be required to work with people who are injured, violent, emotionally upset, or otherwise pose a danger, or who work in treacherous territories such as heavily wooded areas, steep coastlines or swamps, and bog areas. Fish and game wardens wear a uniform and may carry firearms and other defensive equipment. 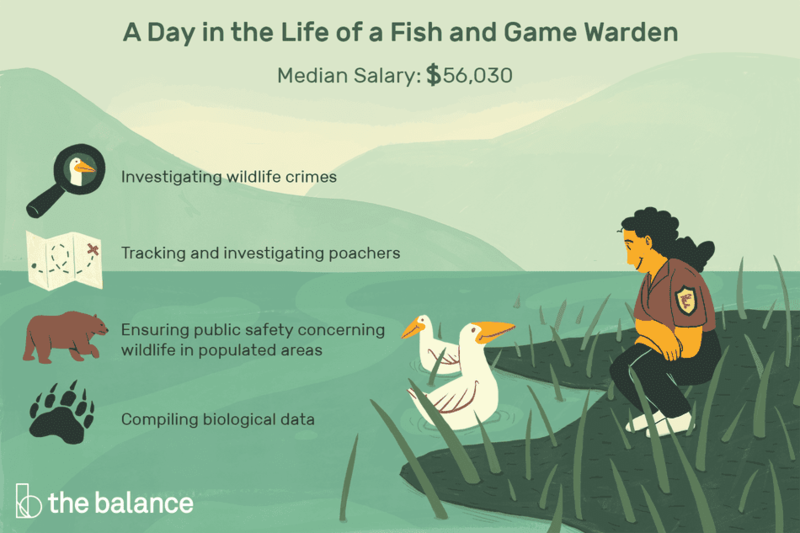 Fish and game wardens may work full-time, and for many of them, hours include overtime. Some wardens may need to patrol large areas, perform surveillance and collect data at odd hours, or respond to emergencies such as rescuing an injured hiker or tranquilizing an animal. In addition, they often work during holidays and weekends when wilderness areas are the busiest with fishers, hikers, and campers. Game wardens' hours are also subject to the behavioral patterns of wildlife, as they spend time observing and tracking animal population levels and health. Look at resources such as Indeed, Monster, and jobrapido, for the latest job postings. Some job sites also provide tips on resume and cover letter writing, as well as obtaining and mastering an interview. Also check your state's fish and wildlife association for positions in this field.